Termites are a fact of life in many states in the US, including Arizona. Whether we have heard of them in school, witnessed termite damage in a home, or even had to have them exterminated and treated on one’s own property. Due to the warm desert climate in which we live, our Chandler properties are commonly affected by pests like this. Remember that deterioration caused by them is not the only thing that makes termites part of our life. For example, after the new law in purchase contracts, termites could be a reason of discuss with your seller. As of Feb. 1 of 2016, the “as is” law in purchase contracts changed for buyers and sellers of real estate. The seller warranties as previously defined in the old purchase contract required that all heating, cooling, mechanical, plumbing and electrical systems, free-standing range/oven and built-in appliances be in working condition. Those warranties are no longer included within the Arizona Purchase Contract. The burden to determine whether these items are in proper working order has shifted to the buyers and their agents. You must be wondering “what do termites have to do with all of this?” Well, now termite inspection is not allowed to be paid by the VA buyer when it was usually covered by the buyer. So, these things need to be negotiated during the process. “The purchase contract revision is a win-win for all parties involved” said Carl Perera, an Ahwatukee real estate agent with My Home Group. In this article, experts expose that U.S. homeowners spend more than $2 billion annually for Chandler termite control and repairs, according to the U.S. Department of Agriculture. They said that if the wood-gnawing pests infest your home, they can cause major structural damage over time. The entomologist and termite expert, Paul Baker, said that homeowners shouldn’t panic if they notice signs of termite activity, but it is important to get the problem under control. Termites in Chandler work really slowly, They’re not going to do that much damage in three weeks or a month, so you can take your time to look for an specialist. About a termite season, he said that, like any organism, when it gets over 100 (degrees), they’re not real interested in doing a lot of foraging. The issue is more related to moisture. So, their most active time is probably mid-September through November and part of December. ABC 15 Arizona in an article written at the end of last year by Sonu Wasu, emphasizes that especially October is a busy month for termites and that it doesn’t matter what you do, every house is eventually going to have termites. Baker said that the normal process is that you should have a termite inspection at least once a year, but if you start to see some termite indicators, to better call somebody to do either a spot treatment or full termite treatment. “When you see the evidence, you treat”, he said. About DIY (do it yourself) Gilbert termite control “In the grand scheme of things, it’s not worth it”, why? These are the reasons he exposed, which we support. 1. You can’t buy the materials if you’re not licensed to buy them. 2. You don’t have the equipment to apply the chemicals. Going back to the point of purchase contracts and that stuff, let’s suppose you did and months after you decide sell your house, you have to disclose it was treated by you. So, if something happen, they can come after you and say you mistreated the house because you didn’t know what you were doing. Nobody likes being in hot water, and we perfectly know it. So if we prefer to avoid these kinds of problems, it is better that we let a specialist do his work. 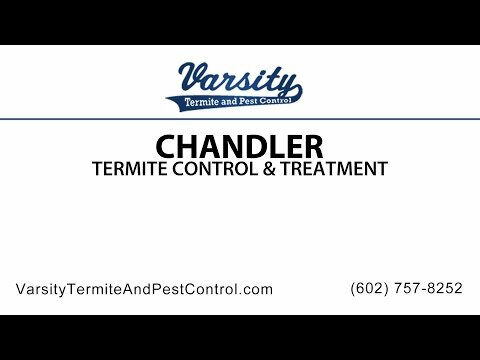 If you have any termite inquiry, feel free to call us, Varsity Termite and Pest Control at 602-757-8252. Ask us about our d free termite inspections near Chandler.